My grandfather's 1918 and grandmother's 1917 Rolex wristwatches. My grandfather's watch is on one of my Type B straps. Click on the picture for an enlarged view. Hi, I'm David. I am always happy to hear if you have comments on this web site, or questions about a watch, or about British or Swiss hallmarks. I live in Cheshire, England. I am a Chartered Engineer with a background in Nuclear Power Station design and construction, nuclear safety and systems analysis, and also Information Technology. I am interested in history, engineering and technology generally. I got interested in early wristwatches when I inherited my grandfather's and grandmother's vintage 1917/1918 Rolex wristwatches, shown in the picture here. I needed a strap so that I could wear my grandfather's watch, but I couldn't find one so I had some made, but in the process of researching what a strap should look like for an early fixed wire lug wristwatch. 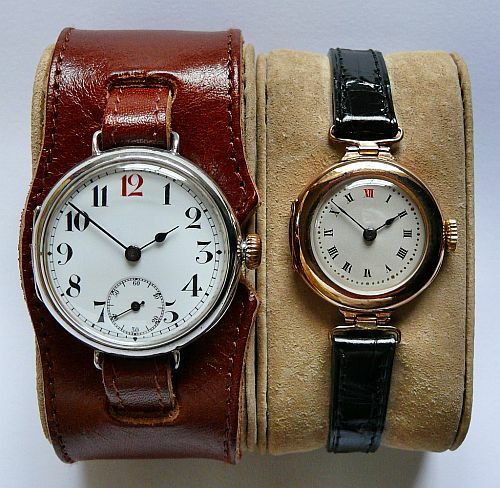 I got so interested in old watches that I now have a significant collection of early wristwatches, I have learnt to service and restore my own watches, and I write about the history of watches and the watch industry. I am a Fellow of the British Horological Institute (FBHI) and a member of the British Antiquarian Horological Society (AHS) and American National Association of Watch and Clock Collectors (NAWCC). I am particularly interested in early wristwatches, especially with water resistant features. In addition to the research published on this web site, I have also had a number of articles published in the NAWCC Watch & Clock Bulletin and the British Horological Institute's Horological Journal. If you want to ask a question about a watch I am happy to try to answer, but I don't give valuations. Please read the notes in the box below first. NB: Please, no more than three photographs - taken in daylight! I am interested in the history and technology of watches not their value, please don't ask for appraisals or valuations. Please note that I do not answer questions about electrical, battery or quartz watches. If the watch case has marks that you think might be hallmarks, start at this page: Case Marks. If there is no obvious name or brand start at this page: Who Made My Watch? To find out what letters on the movement F.S.A.R or A.F.R.S, or FS, AR, or even VN, mean, click this link: F.S.A.R.. Please send no more than three photographs taken using daylight. Images in order of importance: 1: Inside Case Back, 2: Movement, 3: Face. Please send as email attachments. Don't send photographs that are small, blurred or out of focus. If I can't see details I won't be able to tell you anything. Even mobile phones are capable of taking good quality images if you use them properly. There is no reason to send poor quality images. For some easy tips on taking great close up photographs, click on this link Taking Close Up Photographs. Photographs must be taken in daylight. Don't send more than three photographs. To attempt identification of a movement I need a clear image taken ‘square on’ (not at an oblique angle) with the stem at the top, and the Movement Size (follow the link). If you don't send both of these I can't help you. After reading the Notes, email . Please just call me David and remember No more than three photographs taken in Daylight. Sorry if that all sounds a bit off-putting, I really don't mind trying to help. I won't reply over a weekend, but if you don't get a reply within a few working days check your junk or spam folders. Please don't pass on my email address, refer people to this web page. I am happy to answer questions for free, but if I have answered a question, or you find the information on this web site useful, and would like to express your appreciation, of course I am happy to receive a dontation. Any amount will help to keep this web site going and is much appreciated. You can use the PayPal button below to make a donation. A watch is a complicated and delicate machine and it needs cleaning and oiling every so often to reduce wear and prolong life, even if it appears to be working perfectly well. Read more about this on my page Looking after a mechanical watch. There is also advice on that page about how to find a reliable watch repairer to service and repair your watch. Don't rely on qualifications alone, a certificate only shows that someone put in enough effort at one time to pass a test, it doesn't tell you about their approach to looking after a customer and their treasured watch, do some background research. If you have a watch case that needs repairing, get in touch with my good friend Adam Phillips. Adam is a goldsmith with over 30 years experience in the making and repair of all types of watch case, from antique pocket watches to modern wristwatches. Some people seem to feel that anything published on the internet can be copied freely; this is not true. Everything belongs to its author or creator and, except where noted otherwise, all the text and images on this website are my copyright. I have put a lot of time and effort into researching and creating the original content on this web site and I would prefer my hard work to be acknowledged; I think that is only fair, don't you? My copyright extends to images that I have obtained from original sources such as adverts, patents etc. that are out of copyright where I have gone the trouble of finding the original image, scanning or importing it, editing it to remove blemishes, repair defects and make it clearer, rearranged elements of the image to make it more suitable for a web page, colouring parts for easier understanding, etc., etc. In this case my copyright is in the resulting unique scanned, cleaned and edited image. You are welcome to use quotes from the text or images for non-commercial use (including blogs and private eBay listings) provided that you include proper attribution. The statement Information/images from VintageWatchstraps.com © David Boettcher must be included with any material you use. If you use an image this must be in a caption below the picture. For any other use, including any commercial use, please contact me first. Low resolution images are used on this web site because they are appropriate for computer screens and reduce loading time. These are not suitable for print medium and higher resolution versions are available on request.